It's a gorgeous day out today and I'm looking forward to a nice walk with the hubby to see if we can spy signs of spring, although it's very cold out and there's talk of snow! Out with January, in with February. I pulled out my pitiful collection of Valentine smalls and displayed them on our drink cart. I should take a photo of the cart since it's darling and was given to me by my dearest Auntie. Thank you all for your lovely comments on my last few posts. I think I've caught up with my emails. I visited blogs on Saturday night and still have many more to go through. As usual, I have been inspired and influenced by many of the posts around blogland and have even purchased some things! Uh OH!! One blog, a crochet blog, has been captivating my interest lately. Lucy from Attic24 has a delightful blog full of colour and inspiring photos that is a joy to visit. Spying her colour selection for a cheery granny stripe blanket, I put in an order for 17 yummy colours of yarn!! I can't wait to start this blanket! I'm a sucker for colour ever since I was a little girl. 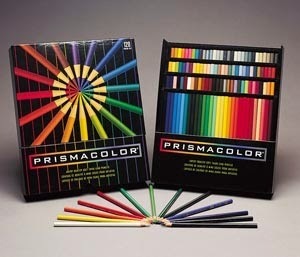 I remember yearning for the 64 Prismacolour pencil colour set, very expensive back then, and received it from my loving grandparents as a gift. I was overjoyed and treasured that pencil set for so many years. I actually used to play with the colours as people...ssshhh!! So I suppose my love for colours hasn't changed much since I was 6! Onto stitchy news...this weekend has been somewhat successful, minus all the frogging I had to do on Knotgarden AND JCS 1707. Two teeny mistakes I had to fix; fixed them, then released I made the same mistake!! UGH. Once was enough but TWICE?! I turned the peacock upside down for the photo. My Friday night SAL with Maggee was successful. I stitched for a few hours and am really enjoying this design! That little mushroom is so cute! My hubby asked what that purple thing is in the bottom right corner and I have to say, I don't really know! It's a tulip like flower but it's in a purple box? Strange but sweet. 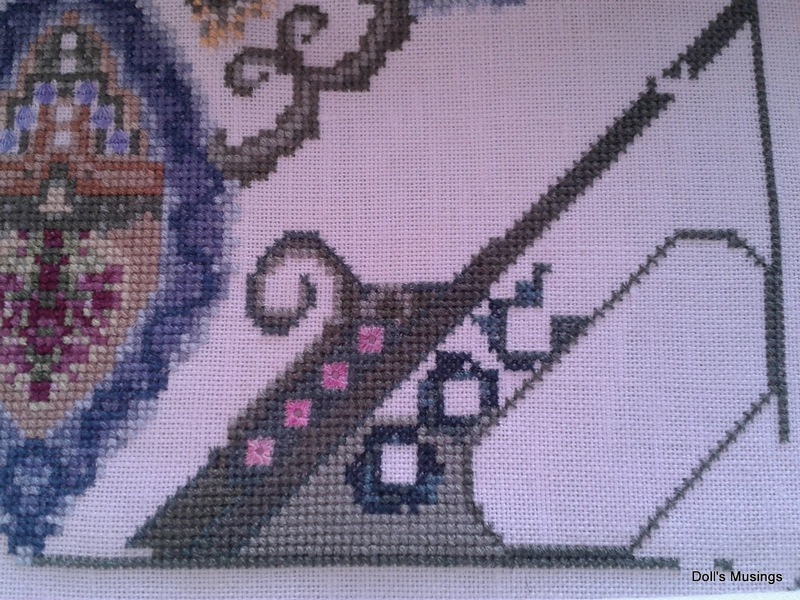 I also started LHN's February design, gifted by Cindy. I figured January can wait for another year! Thoughts of finishing...I need to get a move on that front. I looked through my drawers and found a few small WIP's, and about 5-6 smalls needing to be finished. I can't seem to get into finishing mode at all. I'm always amazed at those who stitch something, then finish right away. Very smart I say! Hopefully next weekend I can get my behind in gear and do some finishing. As for Love Birds, I went and bought a frame for it but the frame won't allow for anything thicker than a picture to be put in. How disappointing :( I'll have to search yet again for a nice frame for the sweet Love Birds. Samplers. I love them. Can't seem to get enough of them so I bought yet another sampler! I know I don't have time for them but I will be retired at one point so why not stock up for then?! 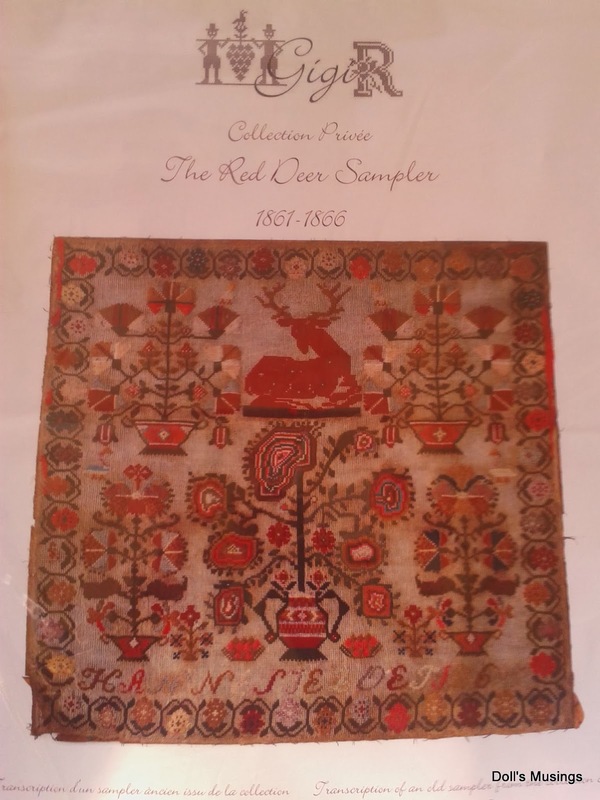 I just fell in love with this Red Deer sampler and had to get it. I think it'll look fabulous next to Hannah's Leopard...which still needs to be framed..oi vai! I think I'm attracted to bright reds in samplers with animal and flower motifs...just sayin'! Onto licking news, while I was taking photos of my WIP's, guess who comes and plops down behind me and starts licking loudly? Yup, get that fur cleaned Titus and then puke it up!! Sigh...loud cat licking can be annoying, especially when it goes on for what it seems an age. Sign off time...here are a few photos for you to enjoy!! Beautiful stitching, as always!! Is that purple thing with the tulip a seed packet, maybe? Attic24 has an amazing blog, doesn't she? I tried my hand at crochet a while back because of her. I hope you have fun with that project. Love all your stitching! I so want to buy that deer design -- it's just so stunning! Really pretty stitching. I couldn't agree more, one can't have too many sampler charts! The cart looks pretty. I think we all love color. The photos are nice. The cat made me crack up, what a character. Great progress on our SAL! And I saw that you won on Mouse's blog--Congrats! 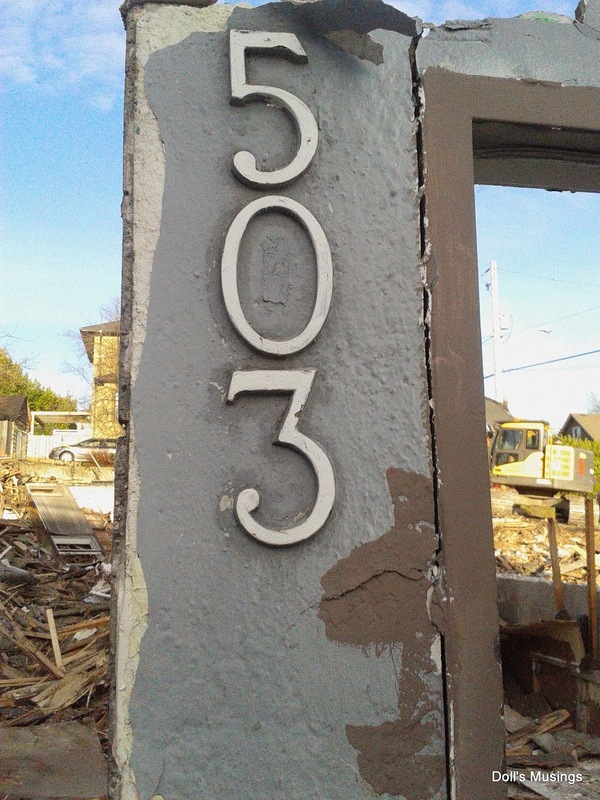 That house number is in front of what looks like house remains... what IS that? Hugs! I always wanted one of those colored pencil sets when I was a kid! I loved the big 64 color crayloas, too. Funny Titus! He sure is a character! Lots of beautiful stitching, Anne. I love that GigiR chart too - lots of reds! yum! Yup, deep freeze coming. At least it looks like we'll get sunshine though. Keep warm! I love the new sampler you have invested in for your retirement!! I follow her a few year now. Really awesome. I have a WIP of a granny stripe in blue. Awesome What she makes. You made great progress on your pieces. We al have too many WIPs. 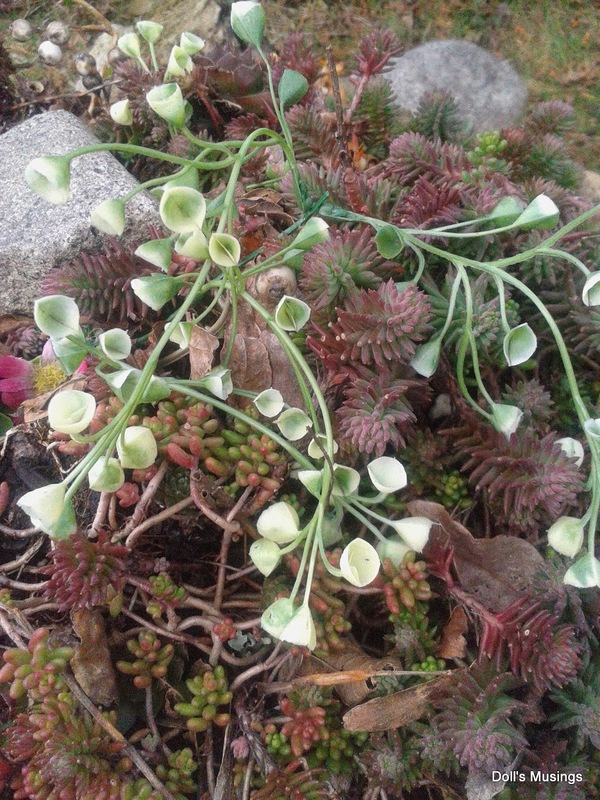 What Is the White flower on the middel pic blow? I love all of your WIP's...they are coming right along. 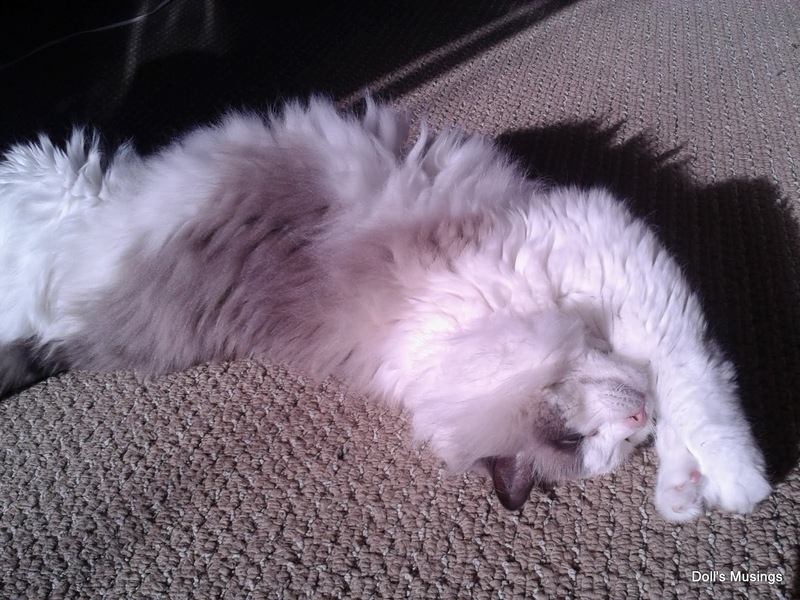 I just love your Photos of your Cat...they are so funny and cute. I have a cat too named Railroad. Ahhh, such loevly stitching on your different projects. And don't be too annoyed about making the same mistake twice - has happened to me as well, and not only once, lol. 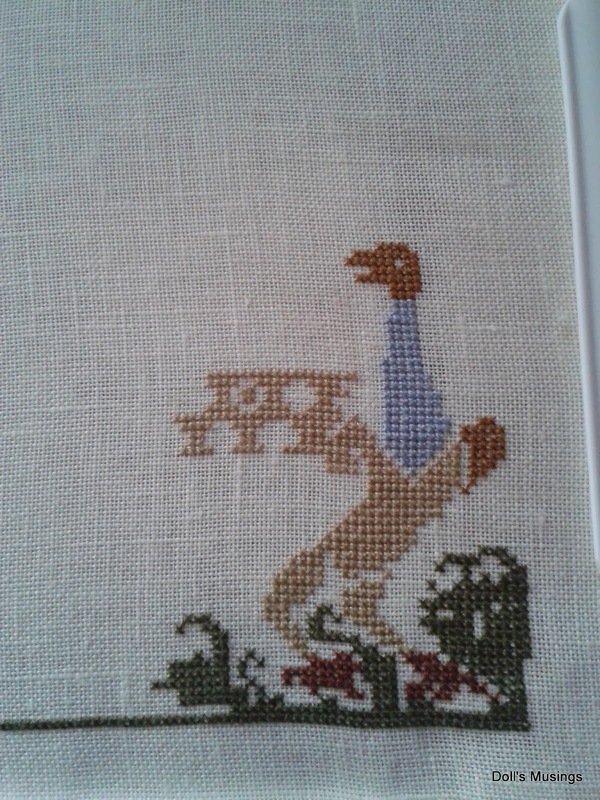 And I'd say, well done on buying The Red Deer sampler, it's a gorgeous piece and you will have alot of fun with it. Lovely new sampler you have picked out. Titus is so gorgeous. Tell me about the last picture Anne. 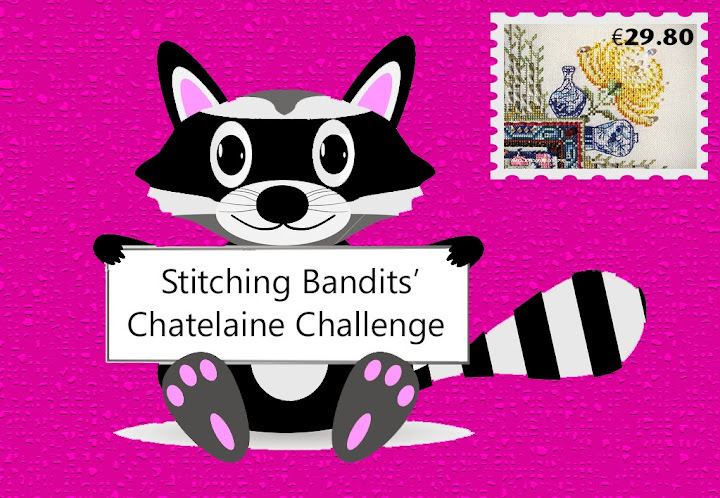 Loads of lovely stitching projects. Great new sampler too! You've been busy, Anne--so many delightful projects to share with us today! I really like your SAL with Maggee--the colors are wonderful in that piece! And the February start on the LHN design looks like it will be fun to stitch, too. LHN pieces are definitely comfort stitching--just like my beloved PS pieces! No surprise stitches, just relaxation at it's best! 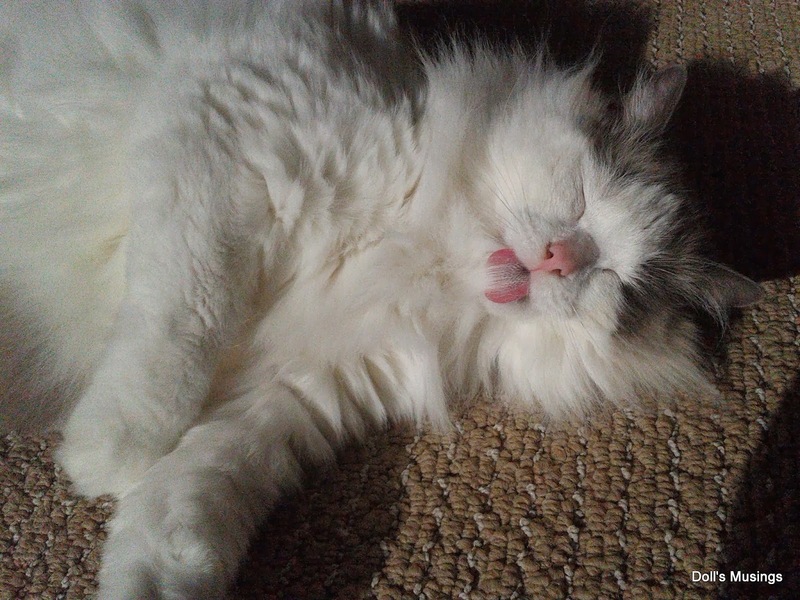 Titus is so fluffy and soft looking--such a pretty pink tongue, too :) Give him a cuddle for me! Ahhh...pencils and colours.....LOVE!! Great stitching and congrats on such an awesome prize from Mouse. 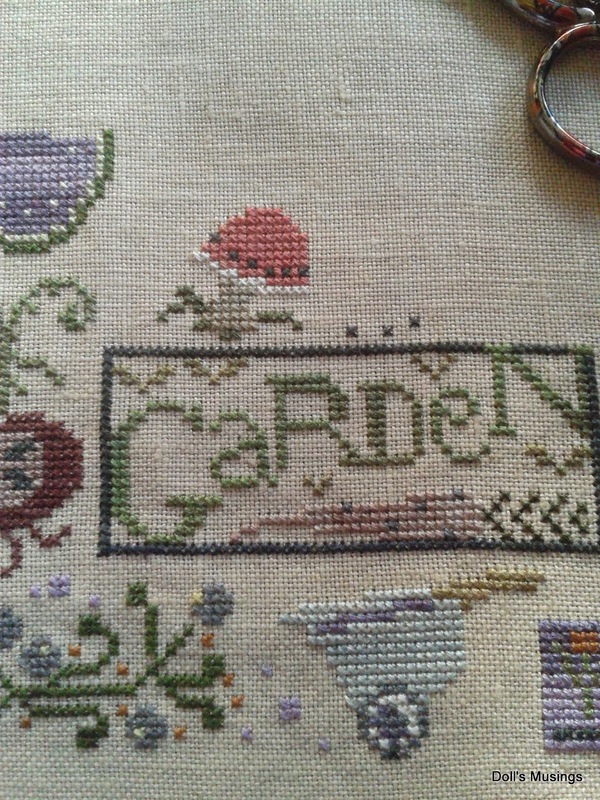 Lovely post Anne, lots of wonderful stitching. Just like a rainbow . I have been lucky today to see two this morning . A lovely post. Titus is adorable, he can come lick here anytime! 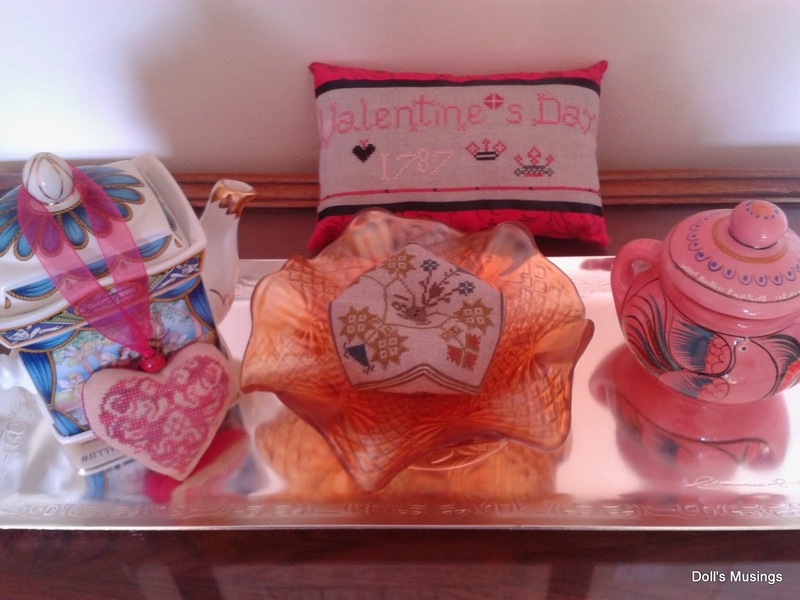 Beautiful stitching project and I love your valentine display, such beautiful items you've chosen for it. It takes a lot of work to be so fabulous. Titus is a hoot! 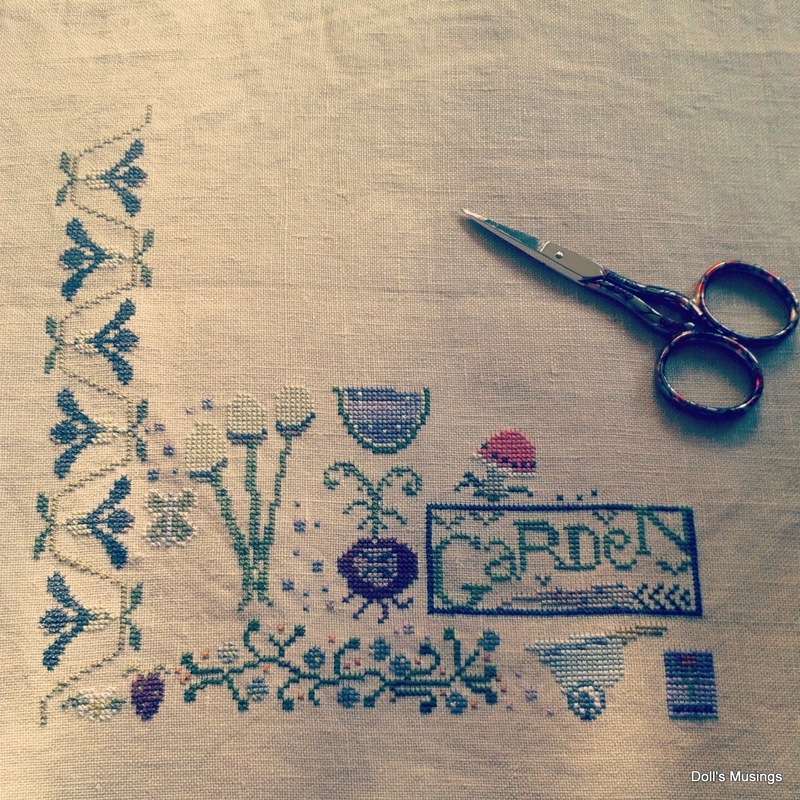 Great progress on your stitching and all of your projects. That little mushroom is very sweet. I hope that you have some milder weather soon! Hahahah Titus is soooooo cute! =) what a joy! I love your Valentine's display, small but perfectly formed! I too love coloured pens but I prefer felt-tips to pencils. My Holy Grail was the flesh coloured Doodle-art pen. I still have it! And yes, what is the significance of the number please? I'm preparing Spring display for the moment. 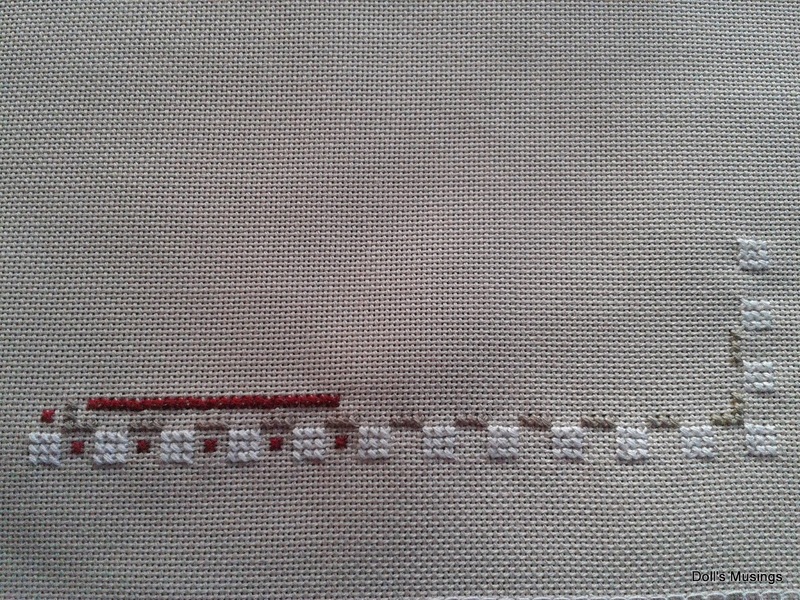 You have some beautiful stitching in progress. 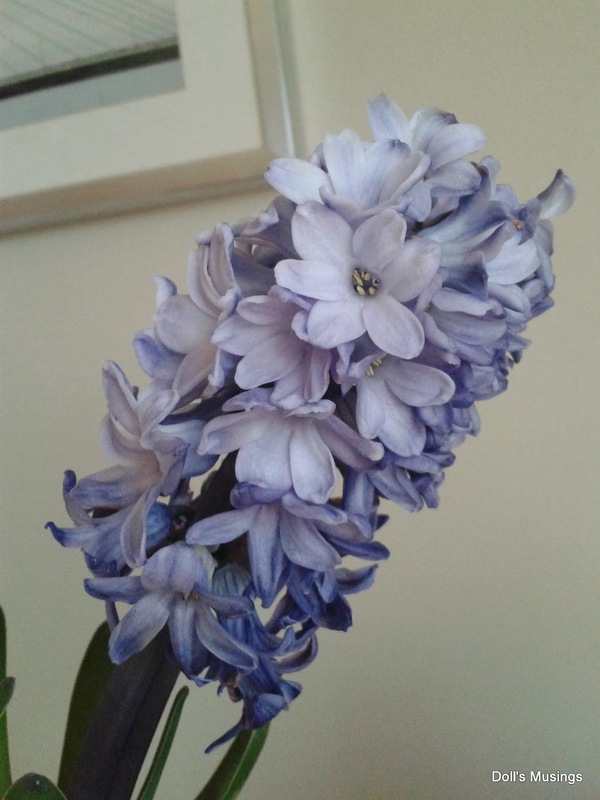 I can almost smell the hyacinth - so pretty. Wonderful progress! The purple flower in the square looks like a seed packet to me. I too love color. I never got a big collection of colored pencils, but I always got a new box of 64 crayons every birthday. Great progress on your projects, they all look lovely. I had those pencils! Loved them! Great stitches ~ and that Red Deer, beautiful! 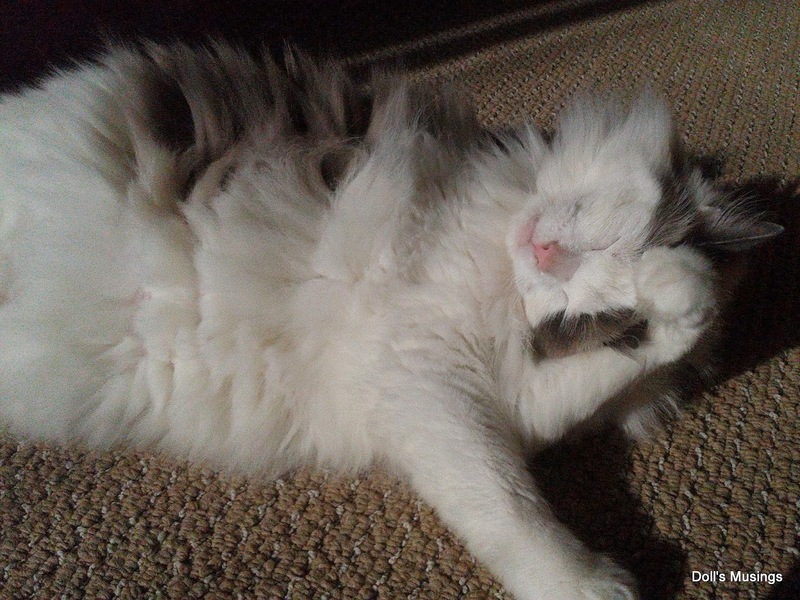 Titus is too funny ~ very proper in his grooming! even if quite noisy!